The Hotel Brunelleschi is undoubtedly one of the best luxury 4 star hotels found in the historic center of Florence: only a stone’s throw away from the Uffizi Gallery, the “Piazza della Signoria” and one of the world’s most famous roads for shopping. 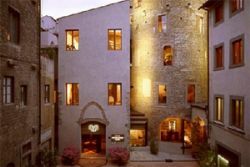 The hotel has been created within a circular Byzantine tower (6th century) and a medieval church, entirely reconstructed, but keeping the original characteristics of the buildings. Inside you can find a private museum in which is conserved the architectural ruins discovered during the restoration of the buildings (an original Roman “Caldarium” or plunge bath found embedded in the foundations).